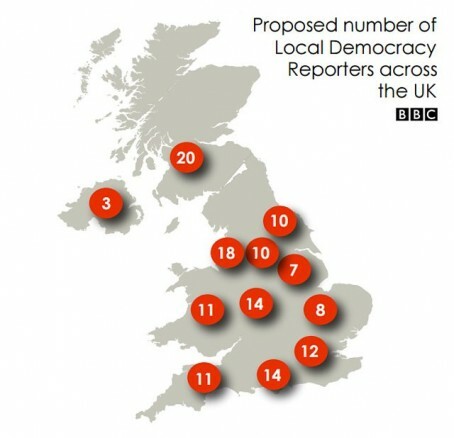 A total of 15 hyperlocal news providers have been ruled eligible to bid for the chance to employ one of 150 local democracy reporters in partnership with the BBC. The initiative will see regional and local publishers given access to £8m a year of license fee money to employ reporters to cover public bodies such as local councils. Content produced by the reporter will be shared with the BBC, while the local newspapers and websites involved will also get access to BBC content. The first phase of the scheme, which determines whether publishers are eligible to receive the BBC content and bid for one of the 150 reporters, has seen 15 independent news providers qualify. They range from a print-only newspaper in Scarborough, to web-only news portals such as wrexham.com and Bristol 24/7. Also included in the list is the Cambridge Independent, launched by Iliffe Media last year and already the reigning Weekly Newspaper of the Year. News of their success has been highlighted in a blog post by the Centre for Community Journalism (c4CJ), a project based at Cardiff University aimed at encouraging smaller publishers. When the scheme was first announced, there was criticism from some hyperlocal publishers that they were being excluded from the project and that most if not all of the funding would go the established groups. Editor of Wrexham.com Rob Taylor said: “We are pleased to have been accepted for Phase One of the scheme and look forward to the outputs. “I just hope it is not used an excuse to cut staff or coverage elsewhere as the aim of the game surely should be an increase in oversight rather than shifting costs. “In theory, it should benefit our readers by having a pool report to dip into where we are unable to cover, plus some additional audio/visual outputs. Among others who have successfully come through Phase 1 of the process are The Lincolnite, West Leeds Dispatch and the Hackney Citizen. The BBC’s Head of Local News Partnerships, Matthew Barraclough told the C4CJ: “The Local News Partnerships have been drawn up to be as inclusive as possible while at the same time requiring a commitment to high editorial standards. Individual council & committee meetings are usually monthly, spread over each month. Admittedly the coverage wouldn’t be immediate, but it isn’t fast moving news either – could be a good way to do it. Harbinger of doom here thinks the BBC plan has an unfortunate flaw. The likes on Trinity, Newsquest etc will use every extra pair of free BBC hands as a good reason to get rid of an existing pair of staff hands.